The un-abated genocide of Shia muslims continues without any break during the sacred month of Ramadhan ul Mubaarak as moments before the aftar ,another momin Ali Raza naqvi was targetted by yazidi terrorists. The incident occurred in the Liaquatabad area no.2 near Jhanda Chowk , in the restive district with continued record of attrocities against Shia muslims ,on almost a daily basis. Shaheed Naqvi Son of Syed Asad Ibrahim was 32 years old and his body has been shifted to Imambargah Shah-e-Karbala Old Rizvia for shrouding rituals . 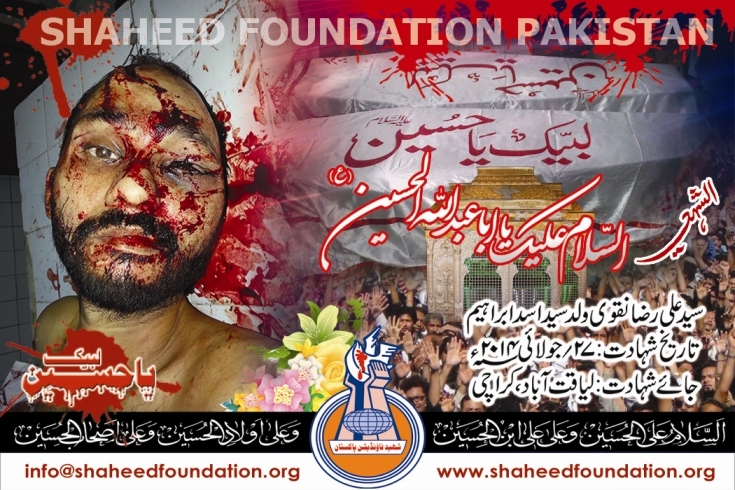 Please recite a fateha for Shaheed Naqvi and Shohada-e-Millat-e-Jaffaria Pakistan.